Google is constantly innovating and releasing new updates to their products and services. This can lead to schools missing out on important changes and feeling overwhelmed just to keep up to date. Collaborative members have access to exclusive monthly live stream events where the Amplified IT team and special guests break down everything you need to know about changes across the Google For Education ecosystem and how it affects schools. 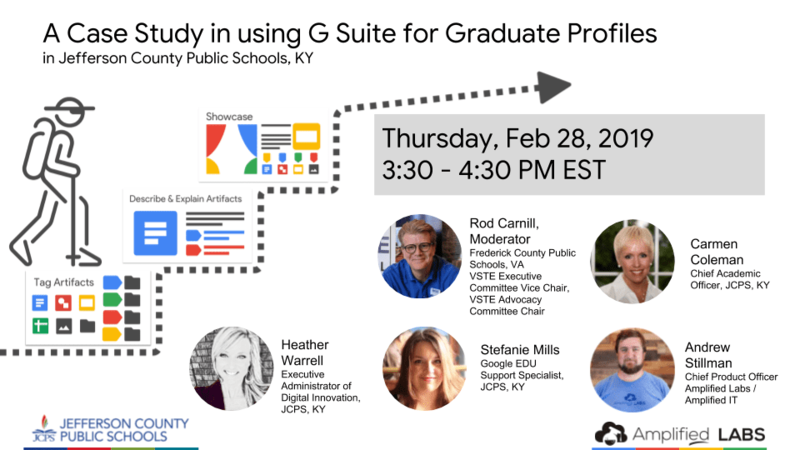 Explore how the Jefferson County Public Schools -- the district serving the greater Louisville metro area -- are using Google tools to drive richer & deeper learning at scale in alignment with Kentucky’s state-wide graduate profile initiative. VA district technology leader and VSTE vice chair Rod Carnill moderates to bring the focus to the needs of Virginia schools. Learn more about G Suite Enterprise for Education including features, K-12 use cases, a walk through of the Enterprise tools, and learn how you can get started on a free 30 day trial for your district.